“Through the Federal Communications Commission and other government coercion, Democratic and Republican politicians run their shameless infomercials on prime time TV free of charge. Tonight’s infomercial hand-outs were the State of the Union address and the ‘opposition’ response. “Unlike Ginsu knives, hair spray for men, and ripped abs in 30 days, the Republican and Democratic infomercials have no redeeming social value. “Honest taxpayers realize you can’t spend more money than you earn. They know that the #1 problem in America today is Government Overspending. “The SOTU and Republican Response infomercials are a grand dog-and-pony show aimed at distracting attention from the fact that Democratic and Republican politicians are equally guilty of driving government spending into the stratosphere. • “Both Democratic and Republican politicians initiated and supported bailouts. • “Both Democratic and Republican politicians initiated and supported mandates to buy medical insurance imposed on individuals and small businesses. • “Both Democratic and Republican politicians have voted for a laundry list of new and expanded government programs – keeping taxes high and driving our national debt to staggering sums that defy comprehension. “President Barrack Obama blamed the administration of former President George W. Bush for driving up debt and high unemployment. “In response, Republican Governor Mitch Daniels threw blame back on the president and on the Democrat-controlled Senate. “Both are correct. Both Democratic and Republican politicians in Washington D.C. are responsible for causing today’s economic woes. “Both Democratic and Republican politicians claim their policies ‘create jobs.’ But they do the opposite: they expand Big Government and thereby destroy private sector jobs. Democratic and Republican policies are crippling small businesses that create jobs. “Democratic and Republicans politicians deliver the same policies: High government spending, high taxes, burdensome regulations, endless foreign military intervention and violations of our personal liberty. “Both Democratic and Republican politicians cater to Special Interest greed while dismissing the wants and needs of ordinary Americans. “Today more voters than ever realize that Democratic and Republican politicians are players in the same game of Big Government. They differ only in the color of their red and blue jerseys. “More voters than ever realize that Democratic and Republican politicians are equally responsible for destroying jobs, violating individual rights, and lowering the standard of living for Americans. “The Libertarian Party offers voters a desperately-needed alternative. Since its founding 40 years ago, the Libertarian Party remains unwavering in its pursuit of liberty, free trade and small government. • Dismantling of government bureaucracies and red tape. Libertarian Party Chair Mark Hinkle and Executive Director Carla Howell are available for interviews or comment on the State of the Union and the Republican response. Please contact the Libertarian Party headquarters at 202-333-0008 between 9:00am and 5:00pm to arrange an interview. The Libertarian Party was founded in 1971. It is America’s largest third party. 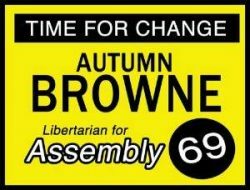 For more information about the Libertarian Party, visit http://www.lp.org.